Is your commercial business looking for new garage doors? There are lots of reasons to upgrade your garage doors. Are they old and unsafe? Garage doors that stick or don’t run smoothly can become a hazard to anyone walking or driving under them. Is the look of your garage doors simply outdated? Perhaps they make unpleasant noises, distracting employees and customers alike. If you are looking for a NYC replacement garage doors expert, we can help. In Manhattan, commercial garage doors can set your business apart if they attract new customer traffic. When you update your garage doors, you can give your commercial building a distinctive new look. 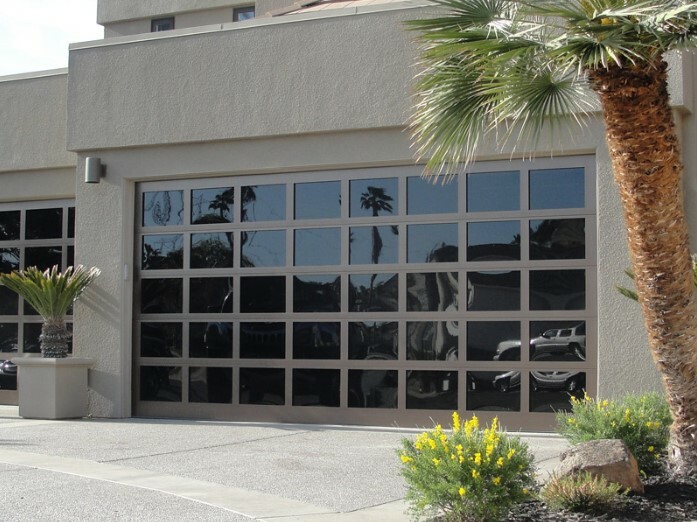 NYC Replacement Garage Doors | How Safe Are Your Doors? When you own a commercial property, safety is always a number one concern. You want to protect anyone on your premises. It is most likely that employees will be using the garage doors at your place of business, and you want to keep them safe. Old worn-out garage doors can pose a real safety concern. Older doors are heavier, and harder to maneuver. Damaged tracks and pulleys mean that the door does not lift smoothly. If the door is out of balance, it will be hard to move. Electronic door opening systems should have back up protection. Don’t wait for someone or something to become stuck in the door’s path. Upgraded openers will cause the door to back up as soon as it even senses that there is an obstruction. Do your current commercial garage doors make too much noise? A professional place of business should be inviting to customers. If grinding, grating doors are driving your customers away, maybe it’s time to replace them. Broken tracks and rollers are often a cause of noisy garage doors. When the rollers do not, well, roll, inside the tracks, the noise can be very unpleasant .To reduce noise further, consider an upgrade to belts from old, loud chains. Also, older doors tend to have poorer insulation, allowing floor noise to spread to throughout the property. Noise from broken springs and worn out hinges could also indicate that it is time to replace your commercial doors. Older garage doors may not have all the security features a business owner wants. Older doors make break-ins easier. Don’t invite thieves in, make sure your garage door is not an easy target, and protect yourself. Business owners have a lot of inventory and equipment to protect. Older door panels are easier to break, rusting mechanisms are easier to move manually, and outdated openers with factory codes are easier to hack. A door upgrade that makes the building more secure, is definitely a sound financial investment that will protect your business investment. Are you looking to update your garage doors to make your place of business more appealing to customers? Making your place of business more attractive increases your foot traffic. Most of us make daily decisions based purely on our sense of sight. When your business looks attractive from the outside, it invites customers in. Replacing dingy old garage doors with clean, new ones is an easy way to brighten up the exterior of your commercial business. When you take care of business, you should also take care of the business property. If your old, noisy, unattractive garage doors are keeping customers away, maybe it’s time for replacements. If they are a safety hazard to customers and employees, contact a New York City replacement garage doors specialist to see which doors are best for your business.